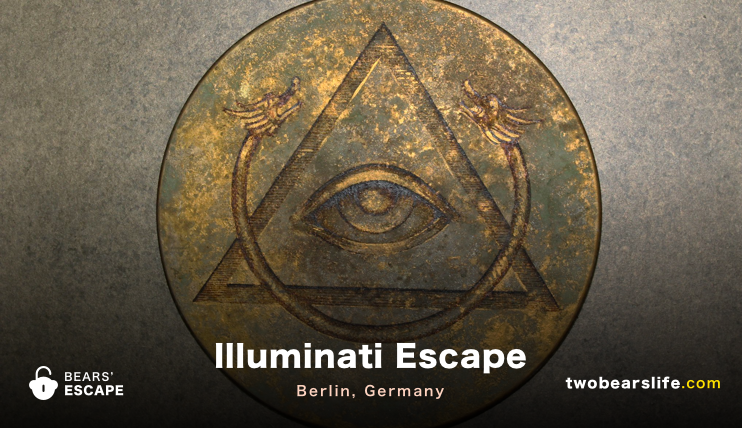 We have visited Berlin fairly often in the last 12 month, but we Illuminati Escape was still fairly new, when we visited them in february 2018. They have finished two of the four rooms they are planning, and the feedback we heard from other fellow escape room enthusiasts was good. Their website looks a bit old-fashioned, but don’t get discouraged: the company really is well worth a visit. 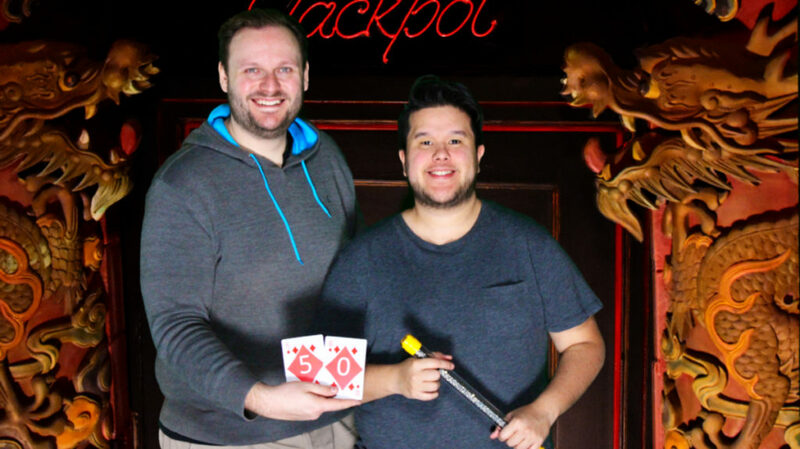 When we found out that our friends overslept, we quickly checked the nearby Escape Rooms and saw, that Jackpot was still free – so we called to make sure if we can come by and the game is playable in english: both were answered with yes. So off we went to the subway. 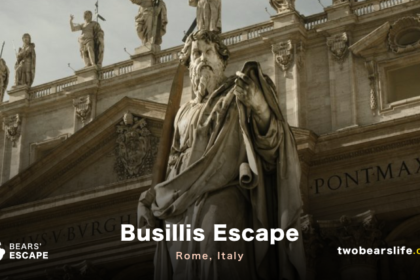 Once we arrived at the location, you will have to walk into a courtyard – there you will find the stairway that leads you to Illuminati Escape. After a very nice and warm welcome by the owners of the company, we put our stuff into a locker, went to the toilet and got our briefing. Once that was done, our journey to Macau China started right than and there. A NASA researcher has been blackmailed: he has passed the blueprints for a top-secret supercomputer to payoff his gambling debts. Your task is to recover the plans from the casino safe in Macao before they are moved – in exactly one hour! For us, the game experienced started before you enter the room. The short way from the briefing room to the game room is so cool and well decorated that it already gives you the feeling that you going to China. The entry to the game is also very well designed. It is cool to see that newer companies take it to the next level and don’t just lead you to a bland white door – well done. Once inside the room, we took a second to take everything in. We were given a suitcase and a notepad during the briefing – the later working as a lifeline to the gamemaster. You find yourself in a small private casino with very fitting decoration. Visually, Illuminati Escape use the small spaces they have very well and never give you the impression that you are just in a refitted office building. The puzzles work also well and we did not need to much help from our gamemaster – although we did get help at the right moments. Some areas of the game are rather dark and it is a bit dark to see – but that gimmick is used very sparely and if you really miss an important item like us, you will be directed back to it. There was a port during the game were I nearly got my arm stuck in a hole in the wall though. Granted, I was not supposed to put my whole arm in there, but it looked like I was supposed to do that, so that was a bit “dangerous”. Maybe widen that hole a bit? Anyway – it was not a big deal in the end. The room does offer different stages, which look very different from each other and make total sense in the story flow. There are some interesting and fun game elements in the second area that made us question the mechanics of the puzzles so much that we had to ask afterwards how that even works. After some twists and turns, we escaped with 50 minutes on the clock. When we booked the room at Illuminati Escape last-minute, we were lucky that they had a spot for us, but we also did not expect too much of the room. Sure, we have heard some good feedback, but the “old-school” look of their current website made us think that we will be dealing with one of those “do-it-yourself” rooms that we have encountered every now and then. But boy were we wrong. From the moment you enter Illuminate Escape, you will be greeted by Scientists who will give you the briefing for your secret mission. The location has a 60’s spy movie look and feel, but in a good way. The owners seemed very committed and that was also very visible before and during the game. We did not need a lot of help during the game and once we got a clue, we realised that we missed some very clear indicators in the room that should have told us what to do. The only real issue we faced in the room was the “I stuck my hand in a hole and nearly didn’t get it out again” and the metal grid floor in the last room, that was absolutely fitting to the theme and the room, but hurt a but when you kneeled down to work on the last puzzle. Overall, we had a blast and can’t work to come back later in 2018 to check out the others rooms. We were so impressed by the look of the Alien Grill entrance, that was right next to the photo-spot, that we would have wanted to play that room right then and there. And talking about the photo, we got a printed version of our team photo, which is always a nice finishing touch. To sum it up: the room has a good story and immersion, very nice room designs and fun puzzles and tasks. Ideal group size for this one would be 2 to 4. It may get a bit crowded with more people. 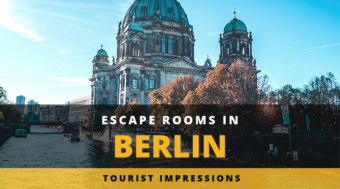 Illuminiati Escape is a great new Escape Room location in Berlin, who set a big focus on room- and puzzle design. 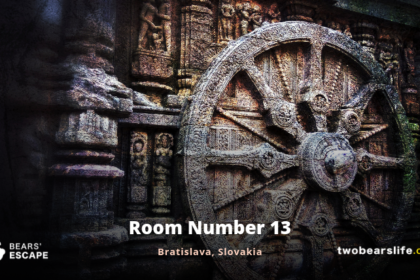 We have only played one of their rooms – Jackpot. We played it with a 2 person team and had a great time doing it. Our gamemaster was very nice and we felt very welcome in general. 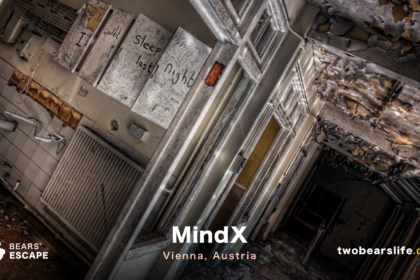 The location looks great and you can clearly feel the love for escape rooms when you are there.